Many new-to-the-track riders are nervous about taking their street bike out onto the track and crashing, and rightfully so. Let’s face it, you’re pushing your abilities, and perhaps even the abilities of your bike. Plenty of people let their bikes pull double duty, but if your street bike is your daily transport, this becomes more of a concern. You’re not without options and you can choose what works best for you. Some folks prefer to take the easiest route, and rent a bike from a company like Feel Like a Pro. There are advantages – you don’t need to worry about maintenance, built in pit crew, just show up with your gear and go. Disadvantages are that if you get bit by this bug, it can add up in the cost department, or perhaps you’d prefer to ride a different size bike. Next on the list, which was the route I personally chose, is to pick up a “beater” (aka older but built properly and maintained) track bike. They’re not always cosmetically appealing, but with the right bike parts will be a dime a dozen, you’re not going to freak out if you crash it, and you can have fun, learn a lot, and not be worried about how you’re getting to work on Monday. Often these bikes will come with upgraded parts already installed. Disadvantage is that you have another bike to maintain, but if you watch the ads, you can find a decent enough bike to get you going for a very reasonable price. 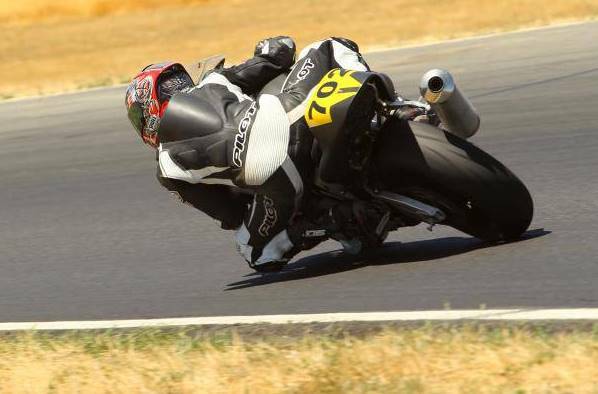 My first track bike was a 2002 R6 that I picked up for $1300 with plenty of upgrades, but cosmetically lacking. Biggest issue with an older bike, which I recently ran into, is that at some point, you’re probably going to be wanting something newer as your skills increase. At that point, you probably have a good idea of what you desire in a bike, your riding style and what you want to accomplish at the track. Choosing your bike at that point will be a combination of your budget, what you want and what’s available. I recently came across a bike and seller that had exactly what I wanted in a price I was looking for and who arranged things in a way that worked for both of us. I decided to go with the Triumph 675, this particular bike is a 2007. Parts aren’t as cheap or easy to come by, but the bike inspires confidence, fits me and works amazingly well with my riding style. One of the final options is to buy a nice track bike right out of the gate. If you’re an accomplished street rider and you’re not worried about fixing a bike if you need to, then there are plenty of folks who take this route.